In what will be a dismaying trend, wake at 5:30 am. Use my phone to light my way around my suitcase, creep into my clothes, and sneak out without waking roommate. Investigate hotel’s ‘fitness center.’ Choose elliptical as least disconcerting option and settle into 45-minutes of feeling awkward and like I don’t know what I’m doing. Back to the room for a shower, hello to roomie who is awake, banana consumed and coffee obtained at the lobby bar, and now–are everyone’s pencils sharpened? It’s time for the first day of class! 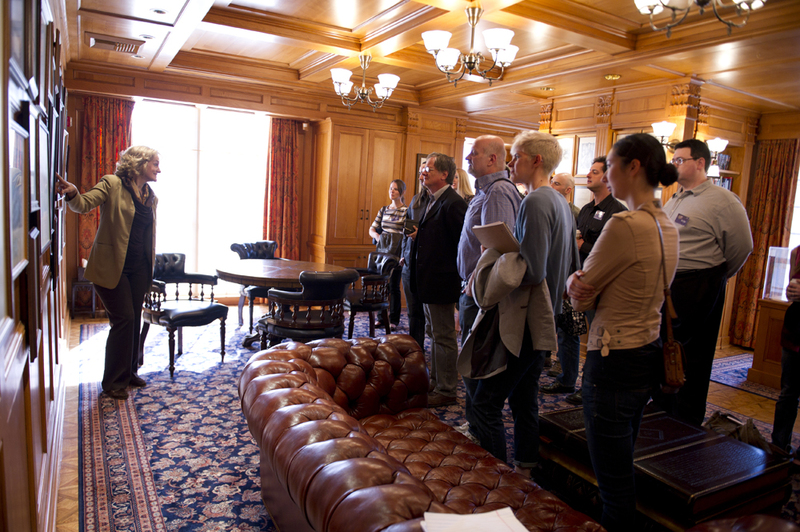 Begin with a tour of the contest library, with photos from earlier contests and works by previous winners. The photo of a jubilant Sergey Poyarkov winning the Illustrators of the Future Gold Award in 1991 excites great comment and contest administrator Joni Labaqui relates an emotional Cold War story. Returning winner Jordan Ellinger AKA Jordan Lapp (Vol. 25) ceremonially places a copy of his novel, Fireborn: Ritual of Fire, on the shelves. Tim Powers leads the herd down the block to Shelly’s Cafe for lunch. After a quick panic (greasy spoon + vegetarian = hungry vegetarian), I realize I can just eat breakfast. Order an egg and cheese muffin with a slice of tomato, and it goes down nicely. –Setting and the importance of transporting your reader to a different time and place. –The writer’s own embarrassment when writing emotional scenes, and how to deal with it. Objects for the famous 24-hour story are passed out. 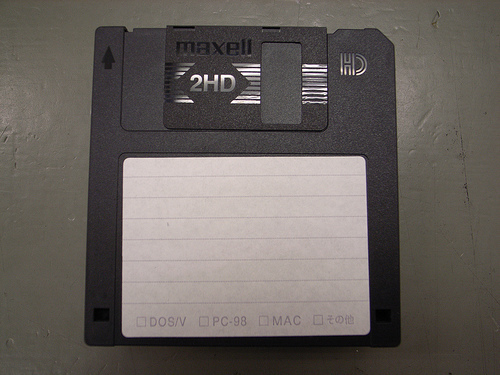 I receive a 3.5″ floppy disk. I’m thinking memory, obsolescence, 1990s…All of a sudden I’m in a K street apartment in Washington D.C. and somebody in the next room is playing Stereolab on repeat. I struggle pack to the present. Class is dismissed and dinner is found…somewhere (maybe this was shared-pizza night at the snooty Italian restaurant? ), followed by a tourist visit to the Willy Wonka candy store in the hotel mall. The illustrator winners have arrived, and a brave few join us for late night chat in the hotel bar. 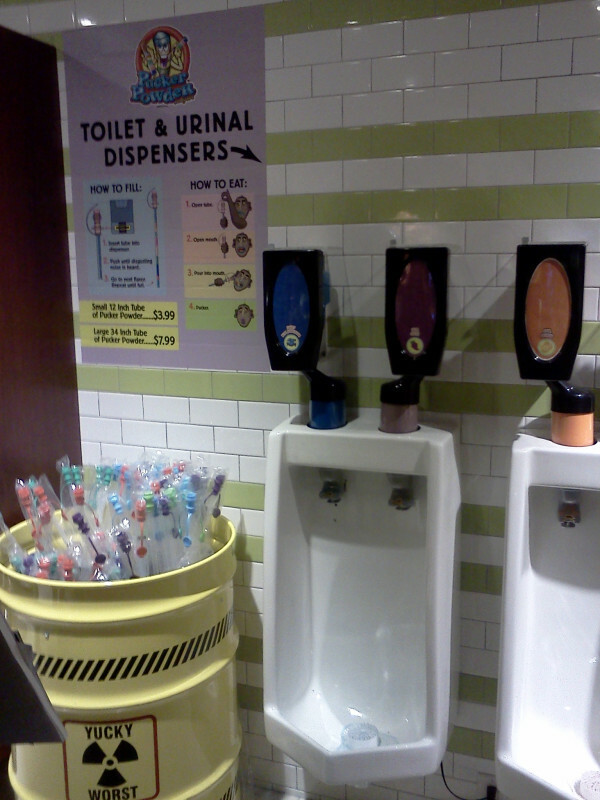 Urinals in the ‘gross’ room at the Willy Wonka store. They dispense flavored candy powder. You can go back and read about Day 1 here. Or move on to Day 3 and Day 4. Categories: Writers of the Future | Tags: Alisa Alering, candy, floppy disk, Jordan Ellinger, Tim Powers, Writers of the Future, Writing, Writing contests | Permalink.